Watch the Climatic Season Finale of “Saints & Sinners”, Sunday April 17th! LOS ANGELES – APR IL 14, 2016 – The police scramble to follow new leads and make a discovery that may lead to solving the murder that has had viewers guessing for weeks in the penultimate episode of Saints & Sinners this Sunday, April 17 at 9pm ET / 8pm CT on Bounce TV. More clues and relationships are uncovered and the detectives inch closer to nabbing their assailant. Also, should they stay or should they go: Sunday night viewers will find out who needs to make a tough decision. Please click here to watch a trailer of this Sunday’s episode and to catch up on Season 1. You can also watch previous episodes of Saints & Sinners on the free Bounce TV app. Saints & Sinners Renewed for Season Two! Bounce TV, the nation’s fastest-growing television network designed for African-American audiences, has ordered a second season of its new mega-hit original drama series Saints & Sinners, currently setting network records for viewership in its inaugural season. The penultimate episode of season one premieres Sunday, April 17 at 9:00 p.m. ET and the first season finale – which will answer the question “whodunit?” – will air April 24 at 9:00 p.m. ET. Saints & Sinners centers around the pursuit of power, intertwined with greed, deception, corruption and murder – all set against the backdrop of a large southern church. The series stars Vanessa Bell Calloway, Christian Keyes, Keith Robinson, Clifton Powell, Gloria Reuben, J.D. Williams, Jasmine Burke, Afemo Omilami and Richard Lawson. 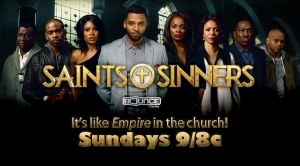 Bounce TV premieres new episodes of Saints & Sinners on Sunday nights at 9:00 p.m. ET, with a primetime play for the West Coast at 9:00 p.m. PT.